Seven Years with the Spirit of Arthur Rimbaud. Holly Tannen has a new CD, her first since her 1999 recording, Rime of the Ancient Matriarch. It's entitled Crazy Laughter: Seven Years with the Spirit of Arthur Rimbaud. At fifty-one I was living on the northern California coast. One foggy August day in a fit of boredom, I rented a movie: Total Eclipse, starring Leonardo di Caprio as Rimbaud. I hated it so much I watched it twice, and stormed around the house cursing at it. The next day I drove into Mendocino to return it. Walking down Ukiah street, suddenly Rimbaud was right there. It wasn't possession trance - I was still there. But it wasn't imagination either. I took down my yellowed copies of Illuminations and A Season In Hell. These aren't poems, they're spells! 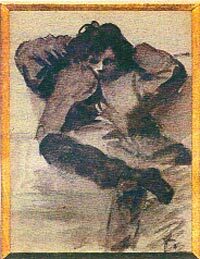 Was Rimbaud, as he claimed, a musician who has invented something like the key of love? Was he, as I have come to suspect, the heir to a long-suppressed European shamanic tradition? The past seven years Holly has devoted herself to Rimbaud's infamous, inept, obstinate, mysterious work of creating a poetic language accessible to all the senses. 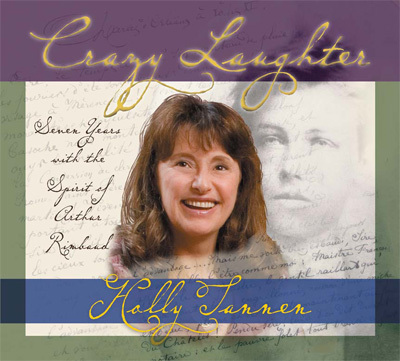 Crazy Laughter includes songs from Holly's one-woman, one-entity show Practical Alchemy: An Exquisitely Perverse Grace, Holly's settings of Rimbaud's poems, and a couple of Holly's satirical songs about life in Mendocino.